Manufacturer of a wide range of products which include green maize silage packing machine, 25 kg silage bag filling and vacuum sealing machine, silage packing machine, murghas packing machine, green maize silage square packing machine and silage square bale packing machine. 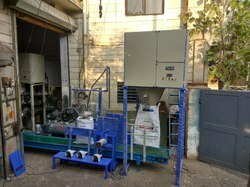 We are manufacturing of green corn silage packing machine with vacuum and hot sealing system. 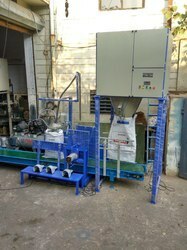 We are manufacturing of Silage bag packing machine as per customer require. Like 25, 40,50,60 and 70 kg bag first weighing and than vacuum and sealing for bacteria free. We are manufacturing of Silage Packing machine as per clients requirement like Box type bag packaging, Vaccum bag packaging and only vaccum and clipping system. Our machine is easily and simply operated by unskill worker. Sigma Automation manufacturer of larrge Tube(Square Bele) Packing Machine is good to pack silage tube with good compaction. Since it has 2 person it can be transported everywhere to work. Packing Material M.S. and S.S.
and large Tube Packing Machine is good to pack silage tube with good compaction. This silage tube can be reused if proper care is taken while handling. 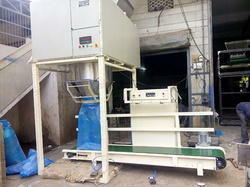 We are leading manufacturer of SILAGE SQUARE BALE PACKING MACHINE. Our machine first silage weight as per setting to 25-70 kg and then discharge in pressing hopper, after pressing hydraulic pressing silage move into rectangle type shape bag. Good Production Capacity 25 kg, 50 kg bags. We are prowided to our valuble client to Proper processing for silage , packing, and storage will help ensure a quality feed for cattle and minimize feed losses. you can use out in the field and as you store your crop. Silage bag packing machine is good to pack silage bag with good compaction.this machine is good for contractors involved in selling silage to dairy farmers, also for farmers who want to pack and store the silage for their own use.machine can be work on field to pack silage quickly. since it has 4 trolley wheels it can be transported everywhere to work.this machine reduce wastage of maize and similar silage crops. it packs the fodder in air tight bag, also it is easy for storage and handling.this silage bag weight is approx. 40-70 kgs. easy operating, high density, compact machine structure, nice appearance, strong and durable, less vibration, low power consumption, simple maintenance, low labor cost.